Steffi Graf is the world’s tennis star she was number one player for ten years. By 2018, Graf is the only athlete who managed to win Golden Grand Slam on all court types, become seven-time ITF champion, and gain all kinds of Olympic medals; she went down in history of best tennis players of the century. Stefanie Maria Graf was born on June 14, 1969, in Mannheim, Germany, into the family of a housewife and a used-car salesman. The girl’s father was fond of boxing and soccer; later, he became a qualified tennis coach; it was decisive for his daughter. 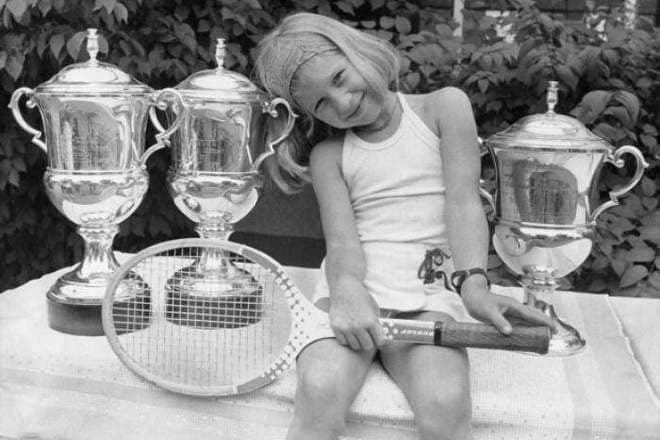 At the age of three, Stefanie went to a court for the first time and started conquering the world of tennis. Initially, Steffi’s motivation was peculiar: the father would give her a cookie for every 25 serves she took and an ice cream for every 50 hits. Graf had high expectations of the girl. Stefanie attended a sports school, and the parents believed in her. At nine, the coach of the German national team checked out her abilities and praised the young athlete; he believed she would become one of top three tennis players in Europe. Inspired, the father was going to make his daughter a perfect winner. At 12, Steffi became the world champion among school students; at 13, she was the second youngest professional tennis player in the history of the sport. At 14, the athlete started home-studying and focused on mastering her tennis skills. She was allowed to participate in adult competitions; at 18, Graf became the leader among professional players. Stefanie’s playing was both aesthetic and tough. Gradually, the unsociable teenager with braces on her teeth turned into an attractive young woman whose court work was pleasant to watch. In1986, Stefanie Graf defeated a leading tennis player: she grabbed the victory from Martina Navratilova. 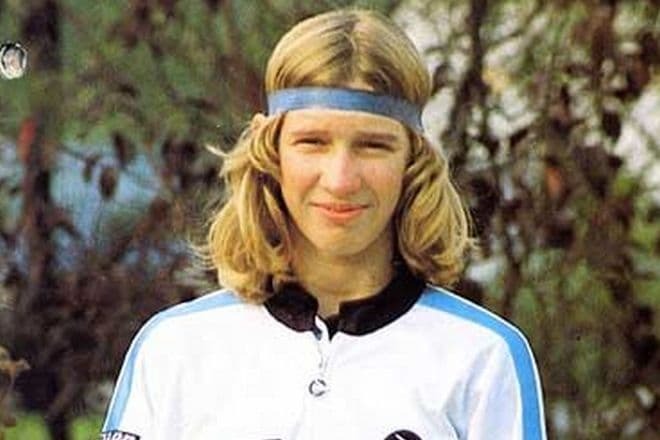 In 1987, Graf won seven tennis competitions in a row; 45 matches were victorious. Graf became the youngest Roland-Garros winner. The same year, the young talent became the ITF World Champion. However, Wimbledon brought her bad luck. 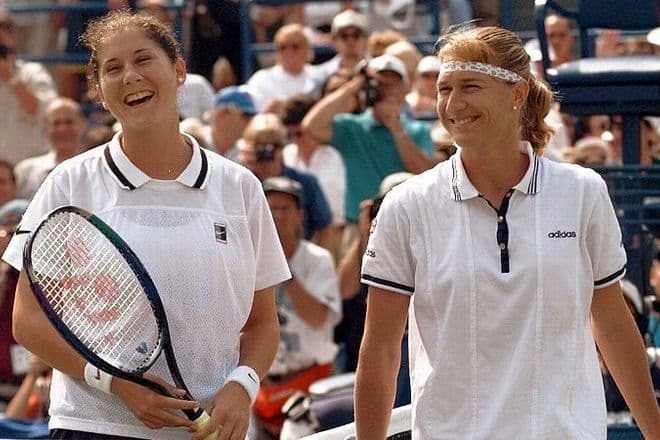 Until 1990, Graf was the tennis queen; later, Monica Seles and Gabriela Sabatini joined Graf’s long-time opponent Martina Navratilova, and the confrontation got more complex. Until 2008, Stefanie held the ITF record: she was at the peak of the tennis rating for 377 weeks. It was the best result among men and women for a long time. 1989 opened the regular confrontation between Steffi Graf and Monica Seles. The Yugoslavian proved to be a challenging opponent to the talented German athlete and managed to defeat Graf several times. In 1993, Seles was attacked by Graf’s mentally unstable fan. The young woman was damaged psychologically and finished her sports career. 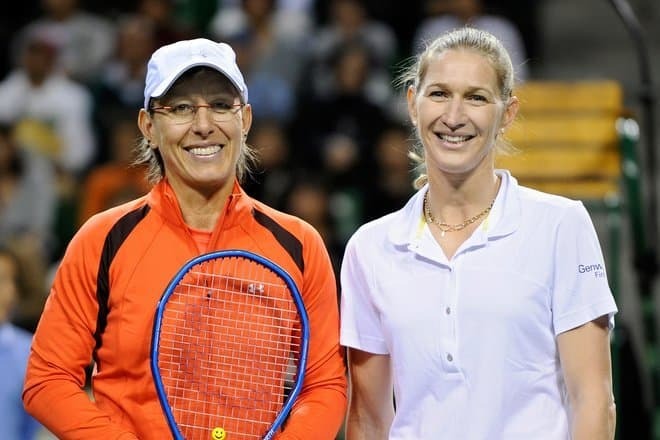 In 1996, Graf was considered the most promising tennis players among those who went to the Olympic Games in Atlanta. Unfortunately, Steffi had trauma. She had to stop training, and the consequences of the injury manifested themselves at court and daily routine. Defeats followed the past triumph. Medical examination proved Graf had problems with joints, and the athlete suffered from back pains. Nevertheless, she won the French Open in 1999 and reached the Wimbledon final. At that match, the athlete lost to an American tennis player Lindsay Davenport. In a month, Graf changed the priorities and finished her professional tennis career. Then, she canceled the contracts with the sports brands Adidas and Wilson and refused to interact with sponsors. She did not take up coaching or advertising. As the woman turned over a new leaf, she found new activities. In 2004, Steffi Graf was inducted into the International Tennis Hall of Fame. Stefanie Graf’s daily routine was so closely connected to sports that she paid no attention to her private life. The media spread rumors about the athlete’s romance with a tennis player Alexander Mronz, but 20-year-old Steffi threw herself in career only. In 1992, Stefanie was dating a racing driver Michael Bartels. Because of their busy schedules, the young people could see each other several times per month, between competitions and training. In 1999, Stefanie Graf met her colleague Andre Agassi whose career was no less impressive than the woman’s. 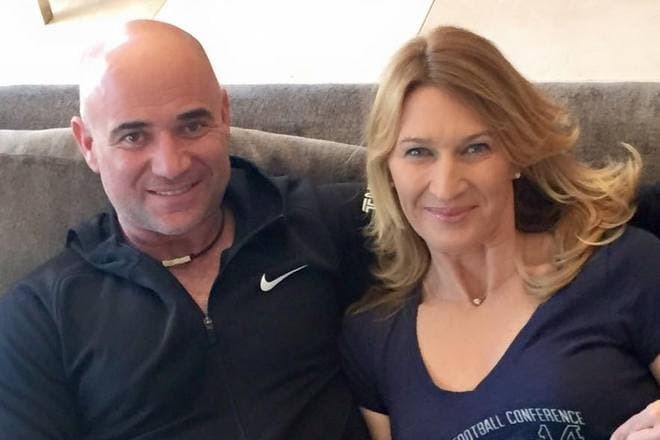 The athletes made acquaintance at a competition; nobody expected the couple’s relationship to last long: Agassi was known for his provocative behavior while Graf was a modest person. Nevertheless, the lovers announced Graf’s pregnancy soon. In 2001, they married in Las Vegas; the son was born several days later. In 2003, the athletes’ daughter was born. Steffi and Andre keep saying they are happy together. In his interviews, Agassi uses the tenderest and flattering epithets to describe his wife. 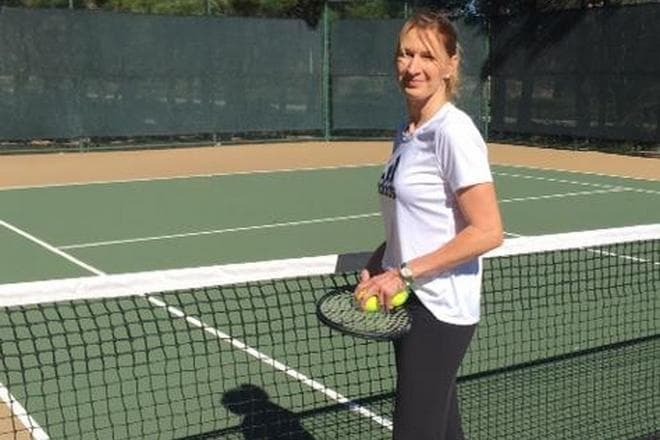 Stefanie Graf lives with her husband and children in Las Vegas. She has finished her sports career but continues to visit show games as a guest; she is an active philanthropist. Today, the former tennis player is particularly interested in art: the woman frequents impressionist exhibitions, listens to music, and reads a lot. Besides, Stefanie is a passionate supporter of Andre Agassi. The former athlete organizes charity events and performances, helps with business, and carries out her husband’s projects. It is not an easy task to find Graf’s Instagram account. However, any Twitter user can visit a page run by the tennis player’s fans. Stefanie’s height is 176 cm., and her weight is 64 kg. 1993, 1994 – Grand Slam Doubles winner.